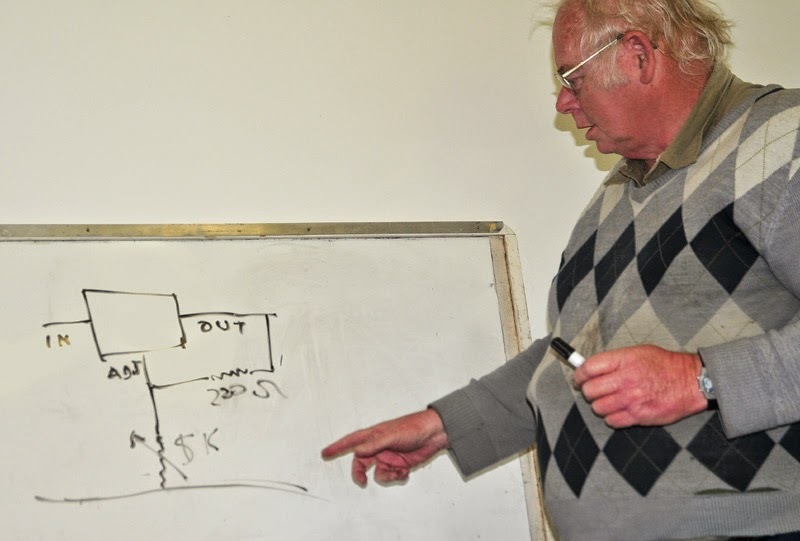 If you missed the Cape Town Amateur Radio Centre’s recent monthly meeting held on 29 June 2014 at 14h00 at the ZS1CT clubhouse in Rondebosch, you will have missed out on one of the most interesting meetings held there in years! 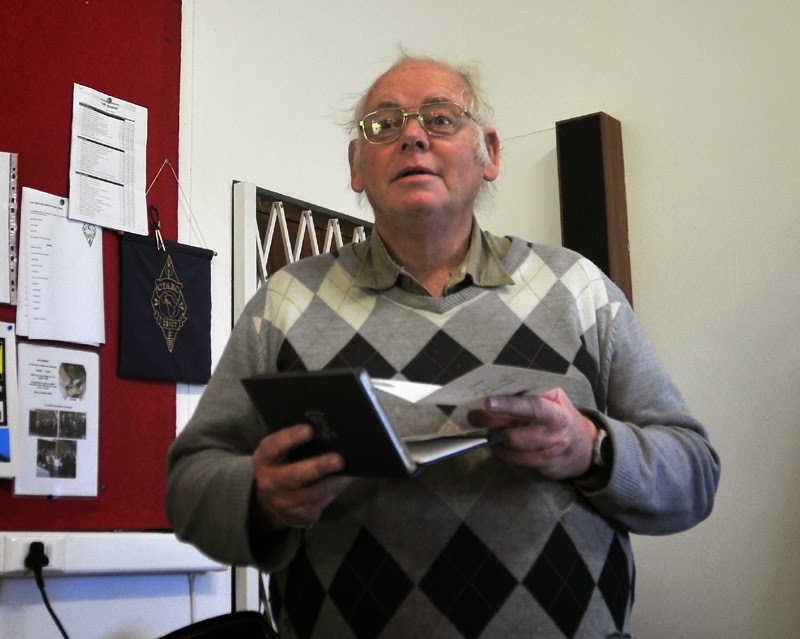 After the announcements by our chairman, Noel /ZS1FW, reminders of the CTARC AGM on 26 July at 14h00 next month, and requests for renewal of annual club subscriptions now due, we went on to the main topic of the afternoon. 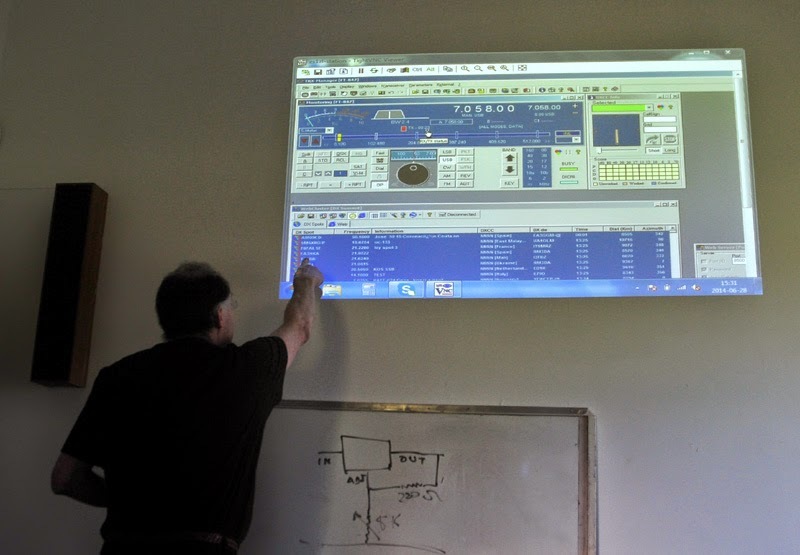 It was in a “show and tell” format and a number of members brought along various projects to show us all. Mike /ZS1FP kicked off the session by showing us several very interesting projects of his (and we hope to publish construction details of these in a future edition of Ragchew). The first item (see below) was a beautifully simple gadget for measuring current consumption in any mains-driven electrical appliance. The essence of the device is a (very well-insulated!) loop of the Line (as opposed to Neutral or Earth) wire. The gadget is plugged into the wall socket, and the appliance to be tested plugs into the gadget. You run the insulated loop through a clamp-type AC ammeter and get your ampère reading from the meter when the appliance is switched on. The next gadget Mike showed us was an electrical safety wiring indicator, consisting of a utility socket box and three coloured neon indicators appropriately wired. 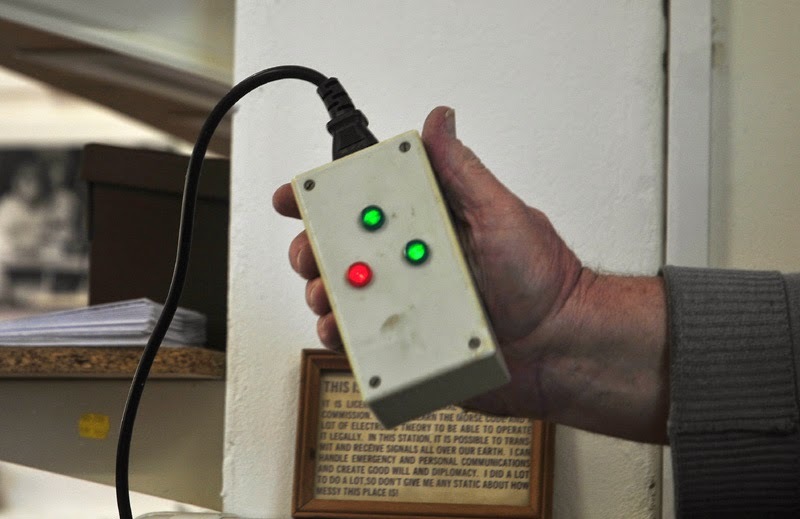 This gadget is plugged into the wall socket, and if all is wired correctly, only the green indicators light up. If there is a wiring fault, the red indicator glows. Above: ZS1FP's wiring safety indicator. In this case, all is well - only the green neon bulbs come on. 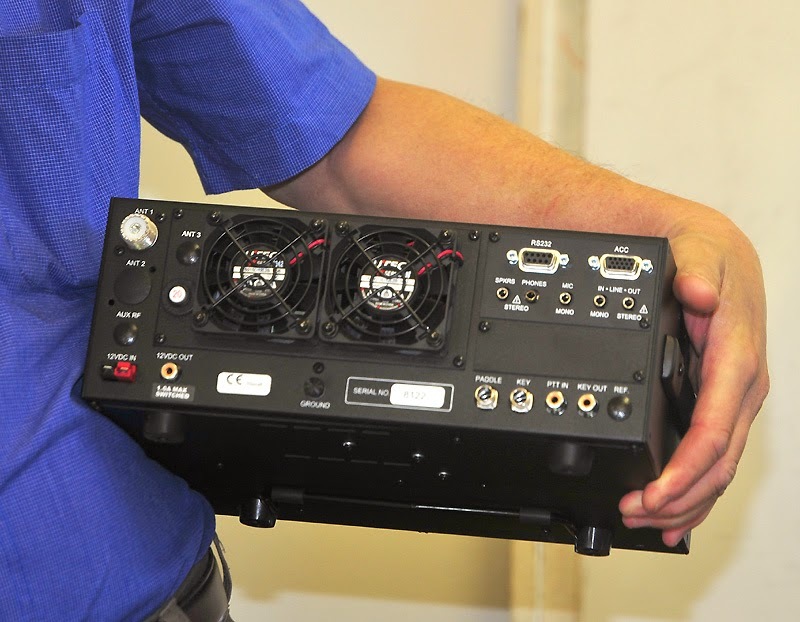 Then Mike showed us a small PSU which he had modified. It uses a very simple voltage regulator chip and a handful of resistors to provide a variety of possible stabilised voltages. Above: ZS1FP points out how simple it is to adjust the regulated voltage, with just two resistors. Above: Z1FP showed us his secial set of commemorative coins, too! Mike’s last item (above) was a set of specially minted coins to commemorate the D-Day landings, the 70th anniversary of which took place recently. Mike’s demo was followed by Paul /ZS1S, who is busy restoring a set of very high-fidelity electrostatic speakers (see above). These work on the principle of a 6 kV electrostatic charge that varies in proportion to the signal from the amplifier’s audio output. 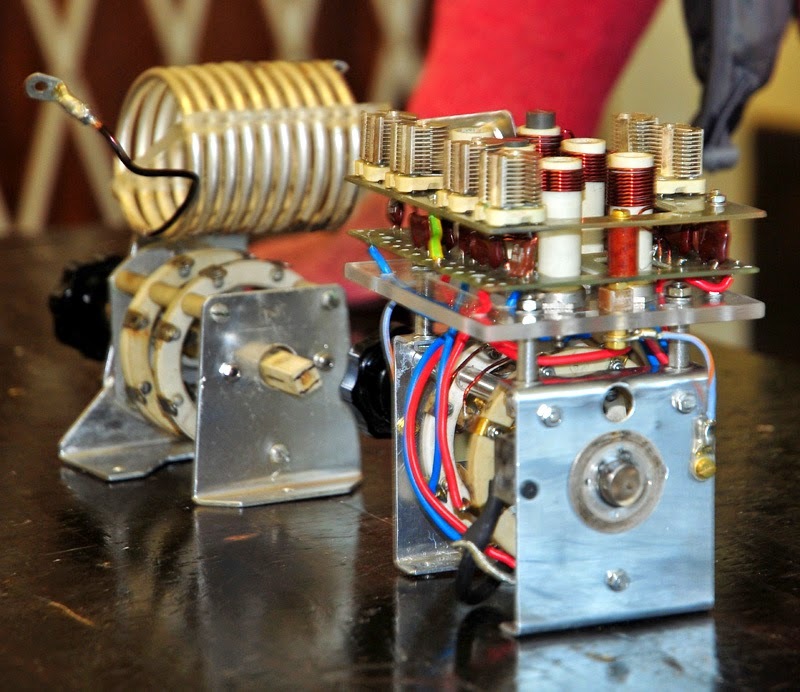 The mildly conductive thin diaphragm between the two charged plates (called stators) moves in sympathy with the impressed voltage change on them and, because of its very small mechanical inertia, it moves extremely quickly and very accurately hence causing the air in the front and back to generate the sound waves which we hear. Each speaker has two bass panels and one treble panel. The problem is that if the audio signal going into the speaker is overdriven, arcing occurs between the charged plates and that burns holes in the plastic insulating film between them. 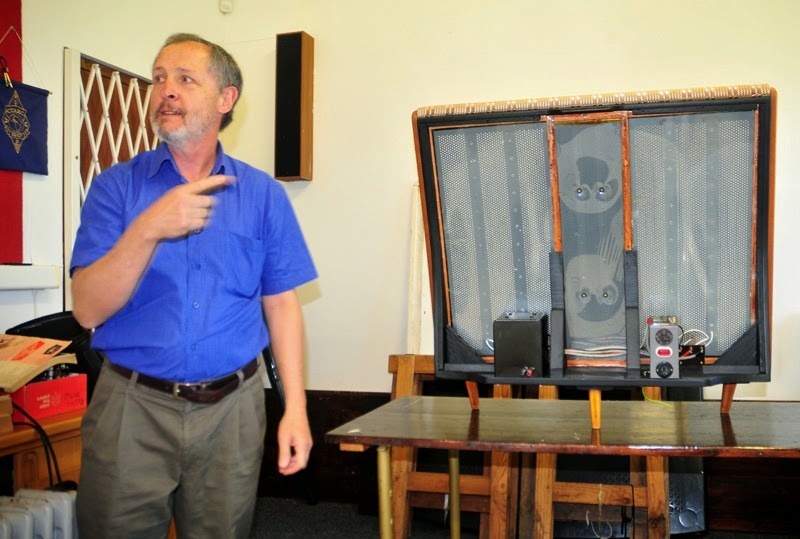 Paul had to scour the Internet to find a replacement for the insulating film used in this speaker. 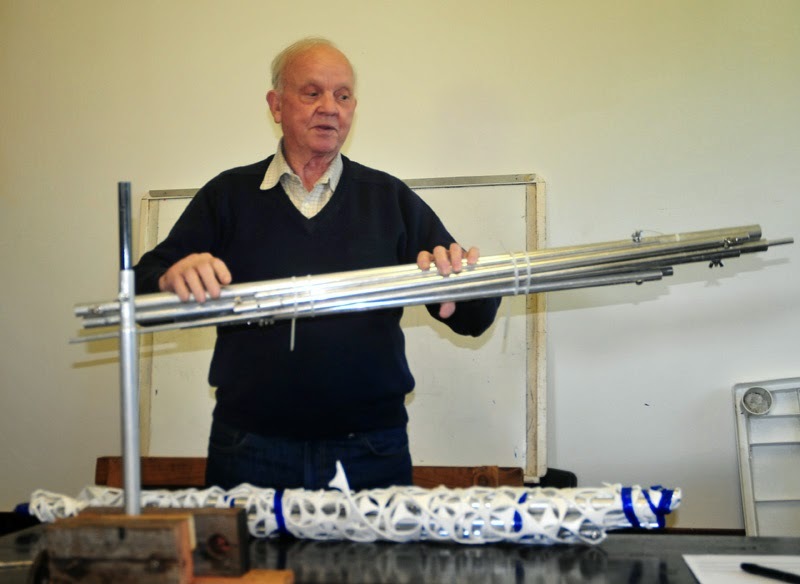 His persistence was rewarded in the form of an overseas supplier who stocks PVC film used for model aircraft fuselages. The audio quality of these electrostatic speakers, particularly in the mid-range frequencies, is said to be unequalled. 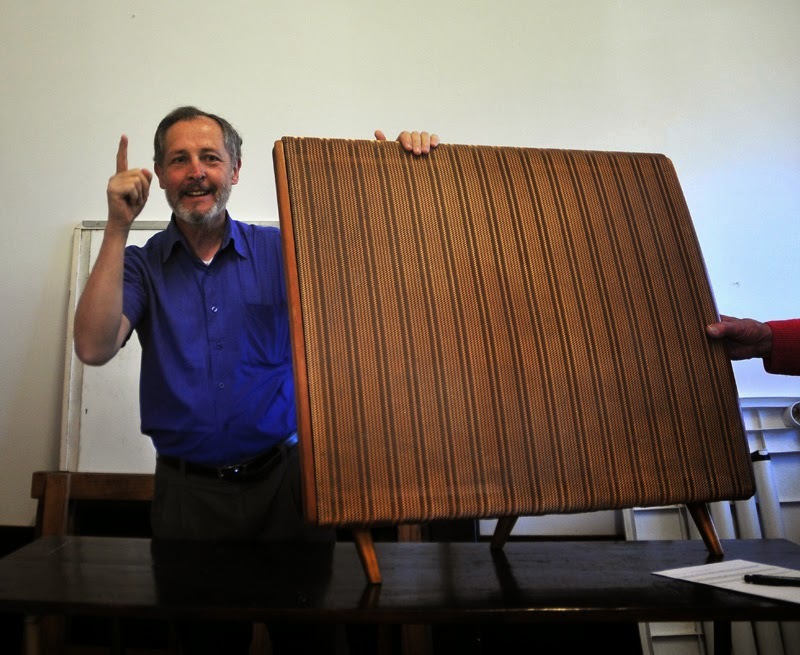 Modern ones cost literally tens of thousands of rands. Above: The K3 weighs in at a modest 8 kg - a manageable weight for DXpeditions! 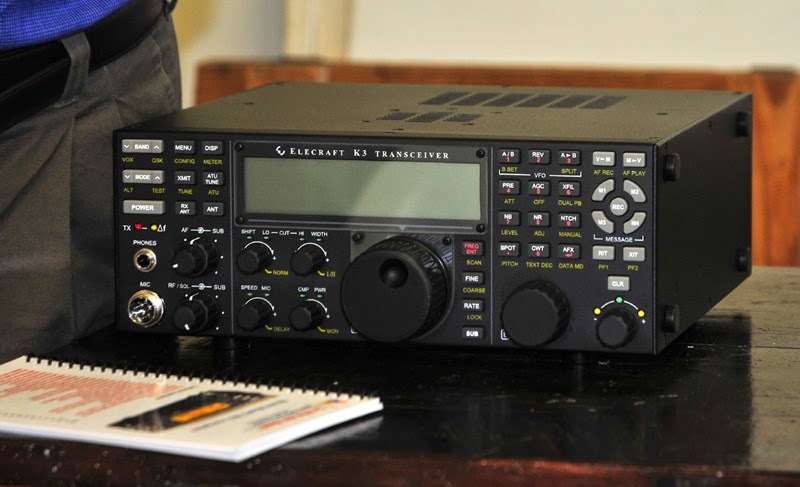 Paul also showed us his latest rig (see above) – the legendary Elecraft K3. This is rated as one of the most capable premium ham transceivers available. Numerous custom modules and options are available – at a price! Paul also mentioned that he will be going on a DXpedition to Tristan da Cunha later this year (hence the purchase of the rig). More details on that exciting project to follow presently. Above: ZS1RIC shows us how to bend and form aluminium brackets in mere seconds, using hand-made tools! 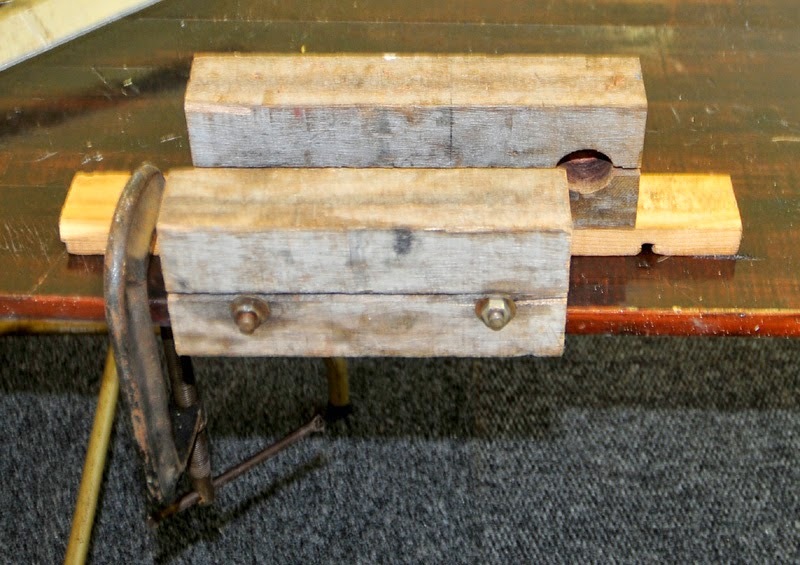 Above: The hand-made vise - three pieces of wood, two bolts and a G-clamp! 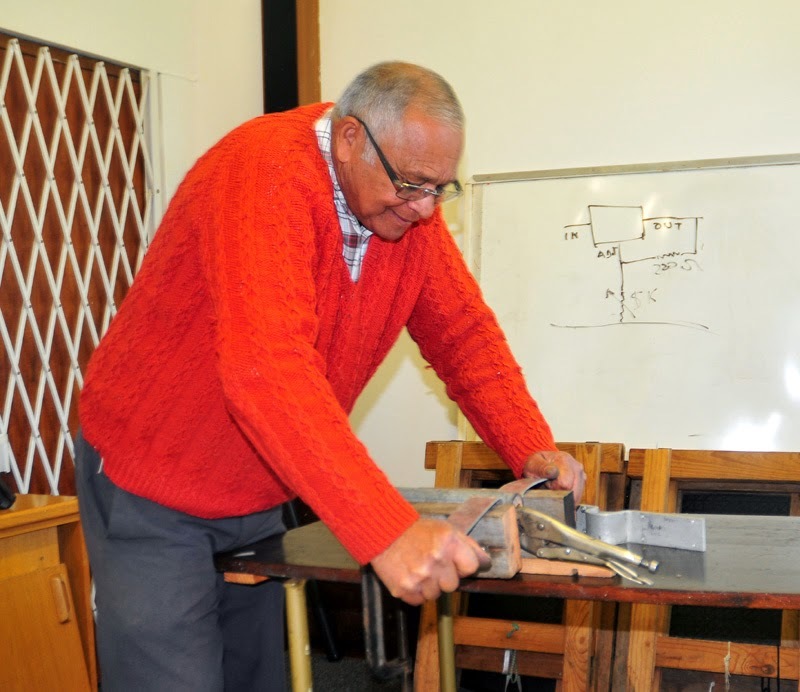 Then, Richard /ZS1RIC gave us a most impressive demonstration of how easy it is to fabricate folded aluminium brackets and other antenna hardware, using a hand-made wooden vice, a G-clamp and a mole wrench! He took literally twenty seconds to deftly bend one of these brackets into shape by hand, before our very eyes. He also showed us another ingenious home-made clamp that he had fabricated out of a piece of old scaffolding and a spot of welding. 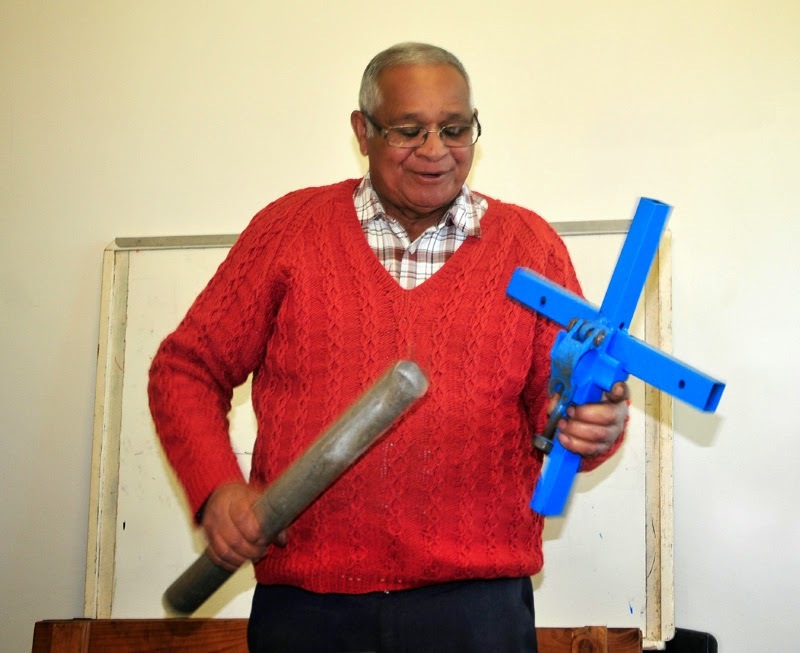 Richard is well-known and appreciated in our club for his prodigious metal-working, welding and antenna-building skills. Barry /ZS1FJ was next. 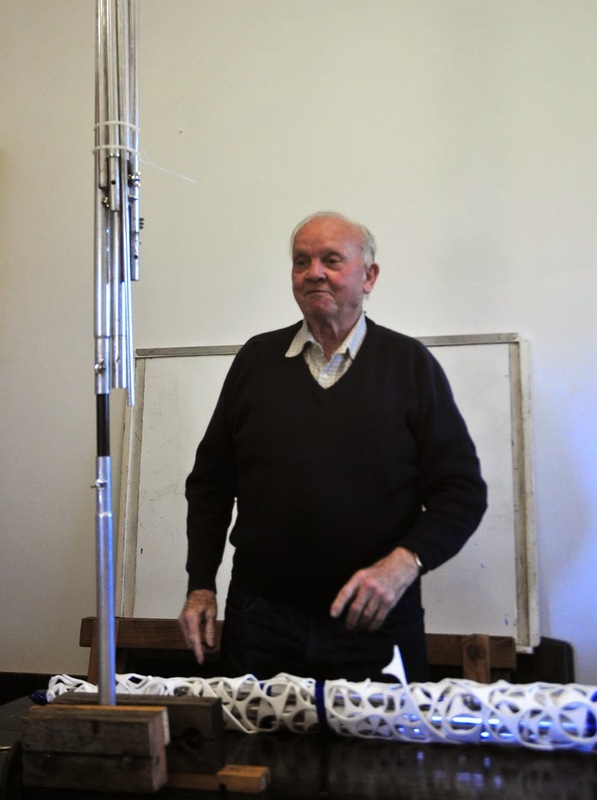 He showed off one of his vertical half-wave monoband dipole antennas with a directional reflector element. These high-grade aluminium antennas, made by SVDR, are reasonably affordable. It was this type of antenna that enabled Barry and one other ham to run up 50 000 DX contacts on one DXpedition! 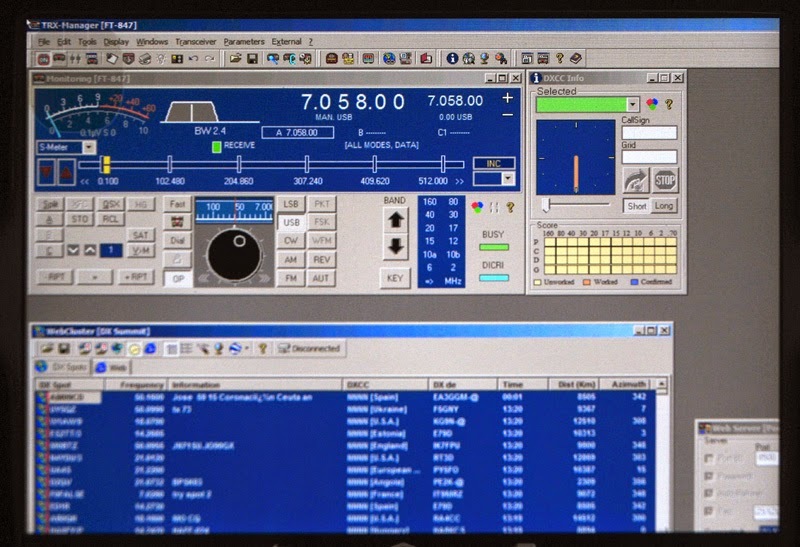 (Compare this to a similar DXpedition where 18 operators at the same location only managed to make 28 000 contacts over a similar time period). The antenna is quickly assembled, requires no radials, and directionality is achieved by simply lifting the vertical reflector element and walking around to place it behind the main element’s desired beam direction. If you feed the driven element with ladder-line, a degree of multi-band operation may also be achieved. Above: Another view of the antenna. Here, part of the the driven element is clamped vertically to show how it is set up (the thinner black section is the insulator between both poles of the driven element). Each antenna element can be quickly dismantled into an easily-carried pack of poles. This portability becomes an important factor when beaching through heavy surf in a rubber duck, or when jumping off a hovering helicopter with only limited time to unload the expedition gear in a hurry! Noel /ZS1FW followed Barry's demonstration. 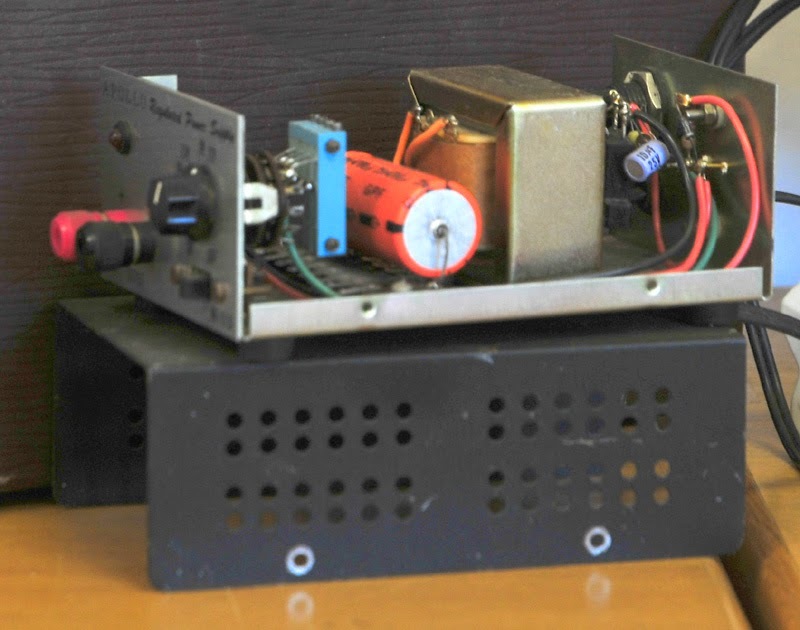 He showed us some beautifully homebrewed switched HF tuning units he has made recently. 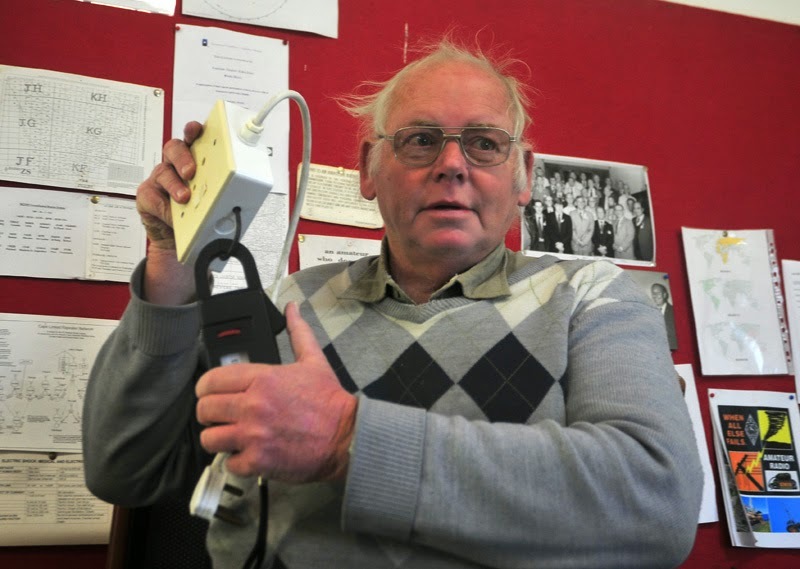 He described the sometimes frustrating process of trial-and-error involved in getting the things to work, and how his antenna analyser proved very useful in doing so. Above: Detiled view of Noel's finely made switchable tuner. Yes, that coil on the background item is silver-plated. 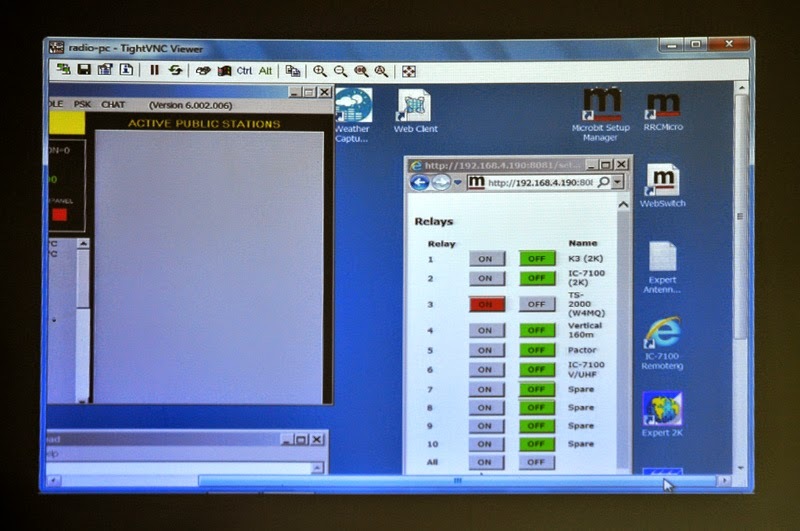 Finally, Deon /ZS1ZL rounded off the demonstrations by showing us his highly sophisticated remote control ham station. 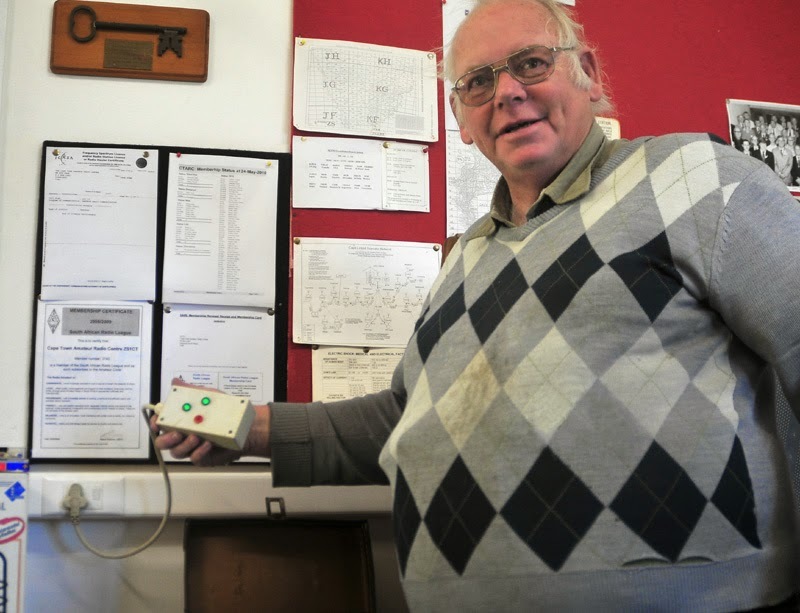 It consists of the control station in at his own QTH, another console at Fred /ZS1FZ’s QTH near Bloubergstrand, and the remote station consisting of rigs, amplifiers and multiple antennas located at Deon’s smallholding in a radio-quiet location. 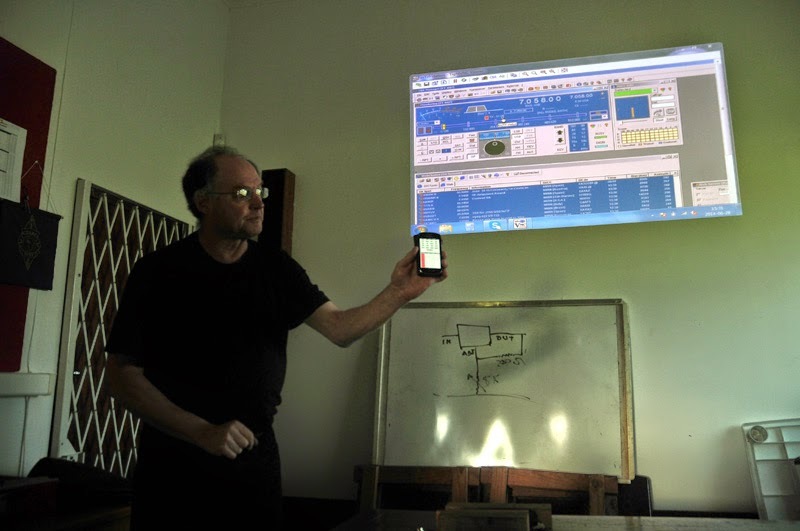 All rigs and antennas can be operated remotely from his or Fred’s QTH via a 5 GHz microwave control link. However, the entire setup can also be accessed and operated via Deon’s smartphone, from any location within the cellphone network’s coverage area. If that wasn’t enough, access and control is also possible (worldwide) via an Internet link, too! 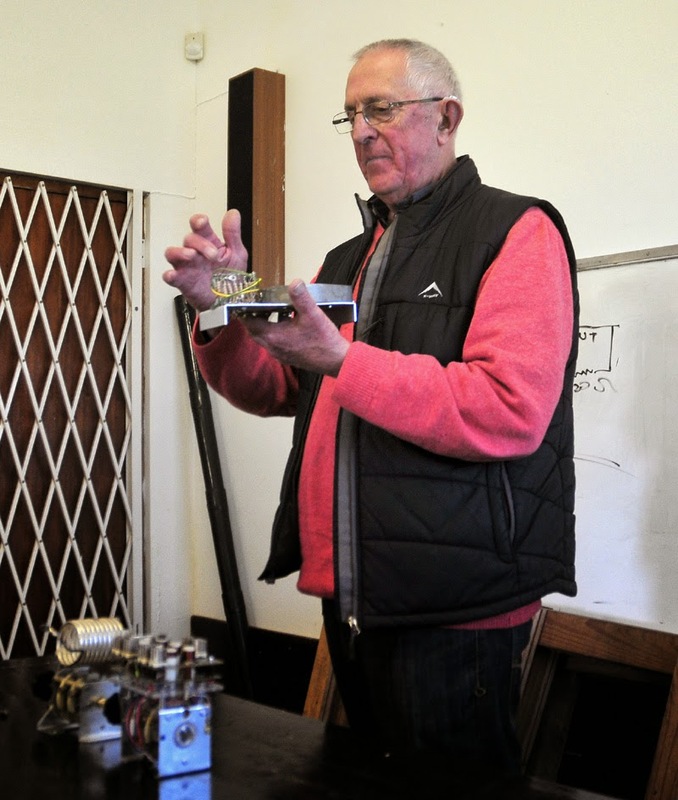 All in all, we were treated to a magnificent meeting, showing off the wide range of interest and talents of members of the Cape Town Amateur Radio Centre. Don't forget that the next (July) meeting is the CTARC's AGM. See you there! The June 2014 edition of Ragchew has been published. You can access it directly [here] or on the CTARC Newsletters page [here]. 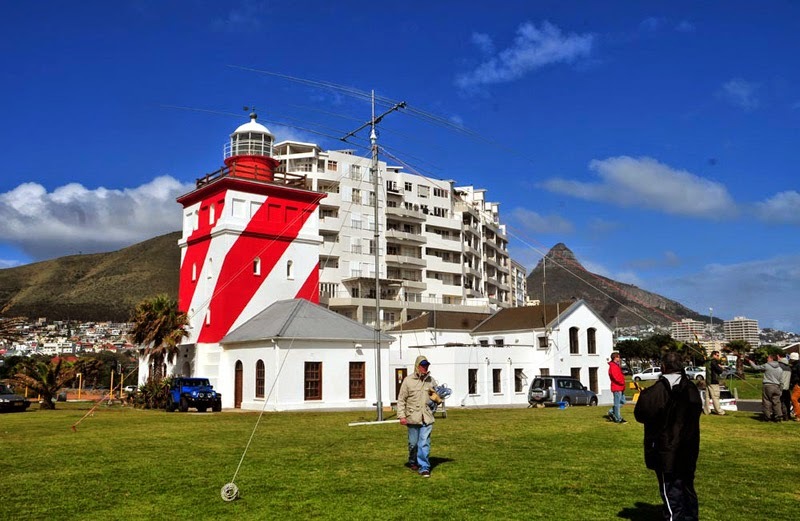 Just a reminder that the CTARC will be running the Mouille Point lighthouse station again, during the annual Lighthouse Weekend, which is scheduled for the weekend of 15th and 16th August 2014. 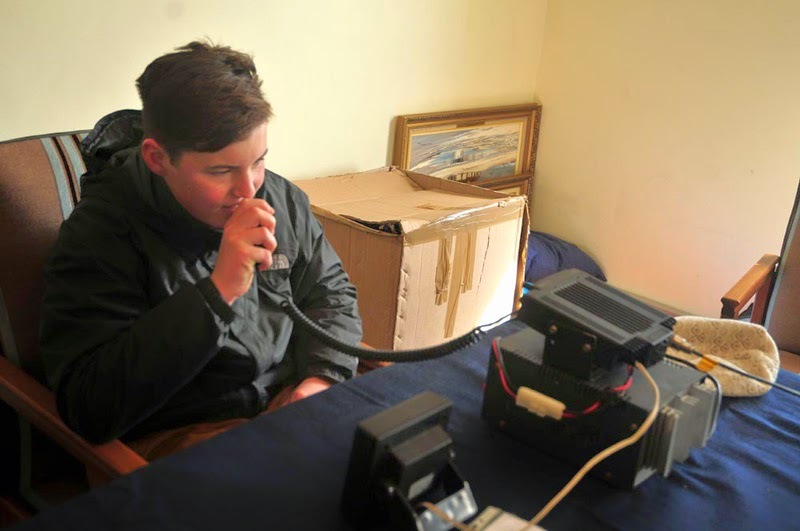 It's always a great occasion, providing the chance to work other lighthouses along the coast, as well as other amateur radio stations. As always, the event will need members to come and assist with transporting and erecting the antennas, operating the station over the weekend, and taking the antennas down again and returning them to the clubhouse on the Sunday afternoon. Please reserve 15/16 August in your diaries!